Stay in the loop! Visit this page leading up to and during the Festival for updates provided by National Park Service horticulturists who closely monitor bud development and progress towards peak bloom. 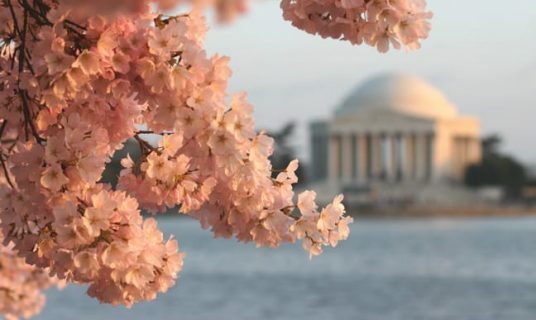 The National Park Service defines the peak bloom date as the day on which 70% of the blossoms of Yoshino cherry trees that surround the Tidal Basin are open. The date varies from year to year depending on weather conditions. The blooming period is defined as the time when 20% of the blossoms are open until the petals fall and leaves appear. The blooming period starts several days before the peak bloom date and can last as long as 14 days. However, frost or high temperatures combined with wind or rain can shorten this period. Below you will find a comparative record of past bud development. The date listed is when 70% of the buds have reached each stage. Current Bloom Stage: Peak Bloom! You can help keep the beloved cherry trees blooming each year! The Trust for the National Mall and the National Cherry Blossom Festival are working together to raise funds to care and maintain the iconic cherry trees. Join this one-time opportunity to endow all 3,800 trees on the National Mall by making a pledge to give, or raise, $1,000 per tree to grow the Cherry Tree Endowment. You can make an individual gift, start or join a crowd-funding team and receive recognition for your support. For more information, please visit www.nationalmall.org/cherrytrees. Your support is vital to protecting the cherished cultural symbol on the National Mall. Join the campaign today!